Citation Information: JCI Insight. 2018;3(4):e95824. https://doi.org/10.1172/jci.insight.95824. Myocardial infarctions (MIs) cause the loss of myocytes due to lack of sufficient oxygenation and latent revascularization. Although the administration of histone deacetylase (HDAC) inhibitors reduces the size of infarctions and improves cardiac physiology in small-animal models of MI injury, the cellular targets of the HDACs, which the drugs inhibit, are largely unspecified. Here, we show that WNT-inducible secreted protein-1 (Wisp-1), a matricellular protein that promotes angiogenesis in cancers as well as cell survival in isolated cardiac myocytes and neurons, is a target of HDACs. Further, Wisp-1 transcription is regulated by HDACs and can be modified by the HDAC inhibitor, suberanilohydroxamic acid (SAHA/vorinostat), after MI injury. 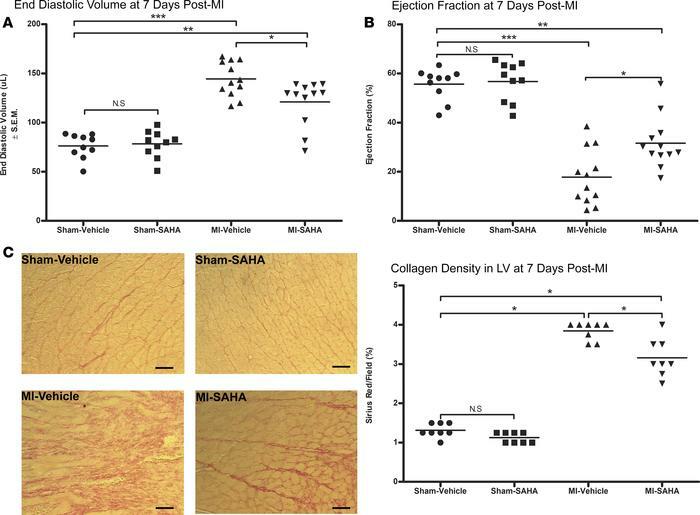 We observe that, at 7 days after MI, Wisp-1 is elevated 3-fold greater in the border zone of infarction in mice that experience an MI injury and are injected daily with SAHA, relative to MI alone. Additionally, human coronary artery endothelial cells (HCAECs) produce WISP-1 and are responsive to autocrine WISP-1–mediated signaling, which functionally promotes their proangiogenic behavior. Altering endogenous expression of WISP-1 in HCAECs directly impacts their network density in vitro. Therapeutic interventions after a heart attack define the extent of infarct injury, cell survival, and overall prognosis. Our studies shown here identify a potentially novel cardiac angiokine, Wisp-1, that may contribute to beneficial post-MI treatment modalities. Inhibition of HDACs improves cardiac physiology at 7 days after MI. Ten- to 12-week-old male CD1 mice were subjected to either sham (control) or ligation of the coronary artery surgery and received daily i.p. injections of DMSO (vehicle-control) or the HDAC inhibitor SAHA (25 mg/kg) for 7 days after MI. (A) End diastolic volume and (B) ejection fraction. (C) Sirius red, a marker of collagen. Magnification, 20×; scale bars: 10 μm. A and B are from 10 mice/sham and 12 mice/MI group and are representative of 2 independent studies. C is from 8 mice per group and is representative of 2 experiments. Results depicted as mean ± SEM, *P ≤ 0.05, **P ≤ 0.01, ***P ≤ 0.001. P values obtained by 1-way ANOVA with Tukey’s post test.